I have tried many pizza recipes and a lot of them are posted here. 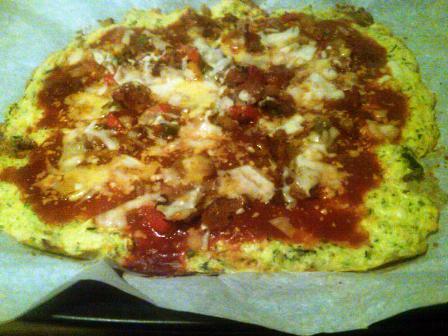 Last night I decided to go way back and try out the pizza crust recipe from the Breaking the Vicious Cycle book. I honestly don’t remember the last time I made it. The first time I tried it was when my husband made the SCD pizza as a surprise for me not long after I started the diet (he doesn’t do a lot of cooking so this was a great surprise!). I didn’t do this crust much after that because it has grated zucchini and I thought it was kind of a pain. But now I have a Kitchen Aid mixer with the slicer/shredder attachment so I thought I would try it out again. I have to say this is now my favorite crust. It was soft, held together well, and had a good flavor. I had to modify the recipe because I didn’t end up with quite as much grated zucchini as the recipe called for. I also use canned tomato sauce. I have a couple of organic brands I like, and I have never had any trouble with them. Of course you can use home made sauce or just slice up some tomatoes to make a Margherita style pizza. Grate zucchini. Place zucchini in a strainer and add about a 1/4 tsp of salt to draw out the water. Let zucchini sit for about 15 minutes. Squeeze out as much water as possible. In a mixing bowl combine all the ingredients. Mix well. Line baking sheet with parchment paper. Spread batter onto the paper in a thin layer (mine was probably about a 1/4 inch thick – so not as thin as other crusts have needed to be). Bake for 10 – 12 minutes until bottom of crust is golden brown and top is set (top should be firm to the touch). Spread sauce over crust. Sprinkle with dried basil (or you can use oregano). Top with vegetables and bacon. Sprinkle with desired amount of cheese. Bake for 12 minutes or until hot and cheese is melted. Wow! This looks fantastic. Nice work! Using egg white and adding a bit of coconut flour will make you pizza crust a little crisper.